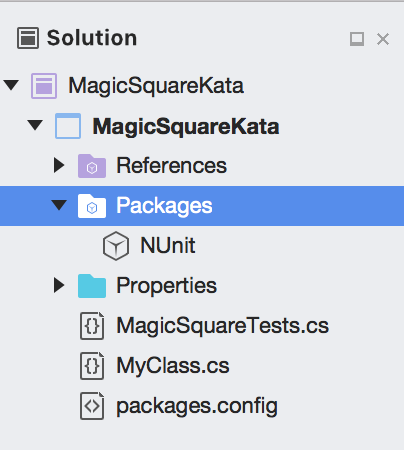 Last month at the AkronCodeClub they selected the magic square kata, which was a new one for me. Basically, you arrange 9 unique numbers in a 3x3 grid such that they add up to the same number horizontally, vertically and diagonally. 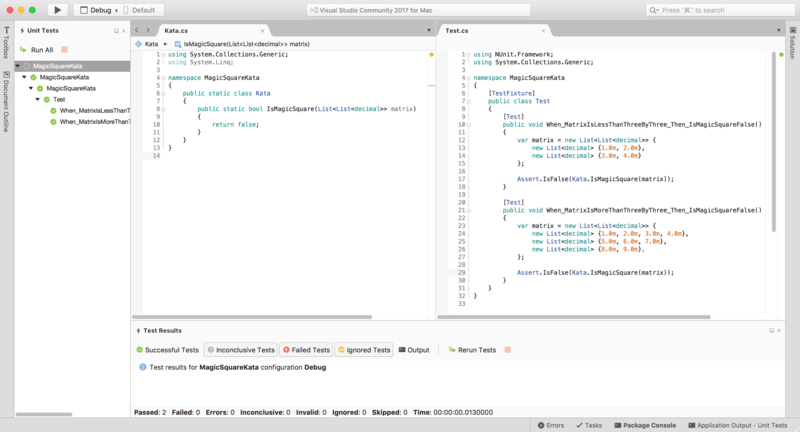 I paired up with someone else who knew C#, so it was a good opportunity to try doing the kata in Visual Studio for Mac! Although I've kicked the tires on VS4Mac a bit, one of the things I hadn't tried testing out was, well.. testing! 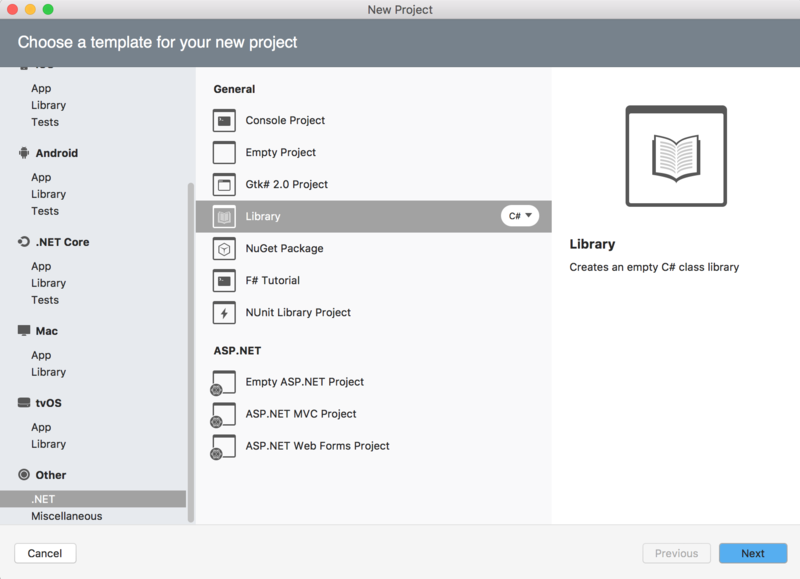 The easiest method is to just create a new "NUnit Library Project". 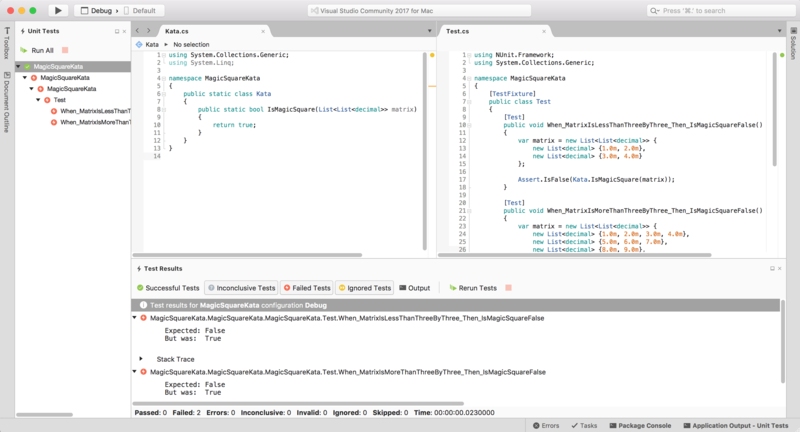 The VS4Mac team actually added a project type that includes the NUnit package and a test file out of the box. How convenient is that?? Like I said, there's already a "Test.cs" file ready to go, with the proper NUnit attributes and everything. Go ahead and create a regular class and add a couple tests against it. You may need to click the build button (black triangle in upper-left) to see your new tests. Or just click the "Run All" button in the Unit Tests pad. Right-click on Packages in the Solution pad and choose "Add Packages". 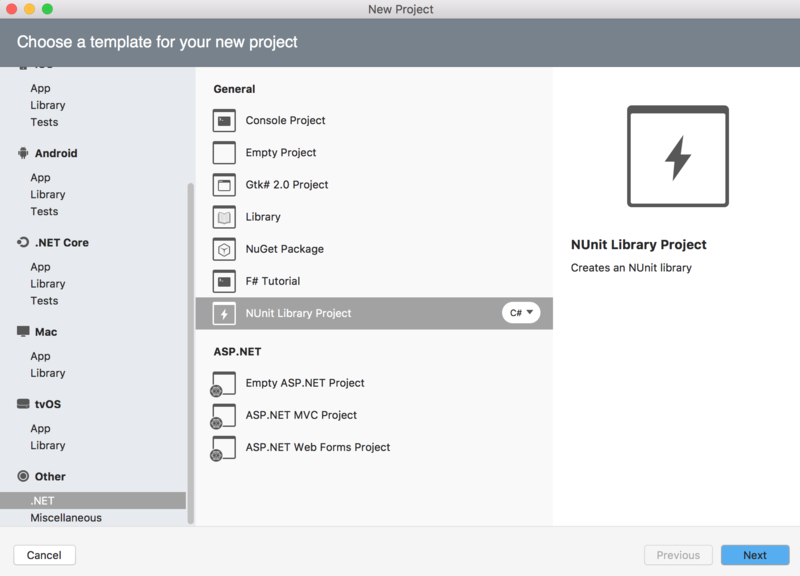 All you need is NUnit - don't bother with the NUnit Console Runner. 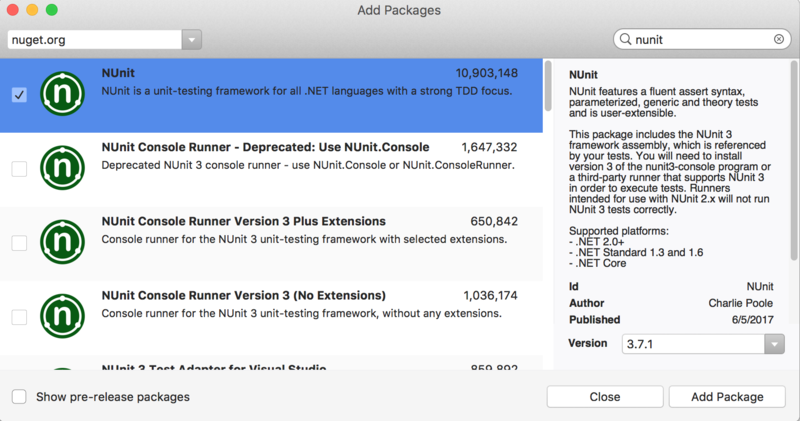 You should see NUnit under the Packages folder. 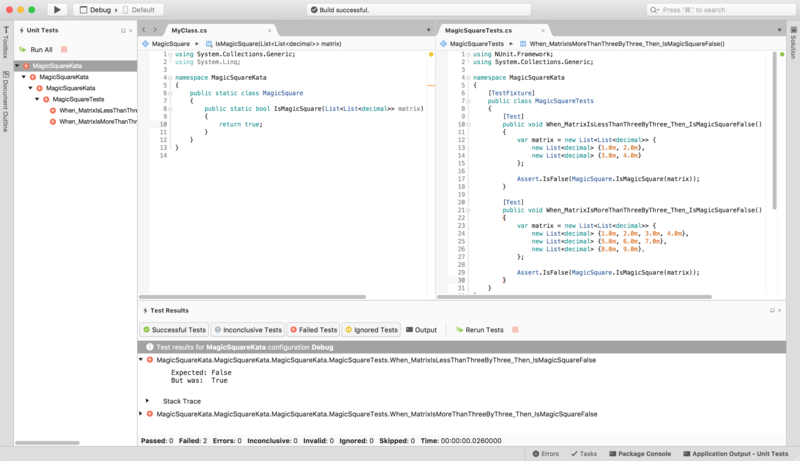 Add some new tests to run against whatever logic your old project has. In my case, I added a single function for the magic square kata, and wrote a couple tests against it that I was sure would fail. The test runner tells you what failed and where. Run / Observe / Fix / Repeat! Try adding enough code to get your tests to pass, and run again. 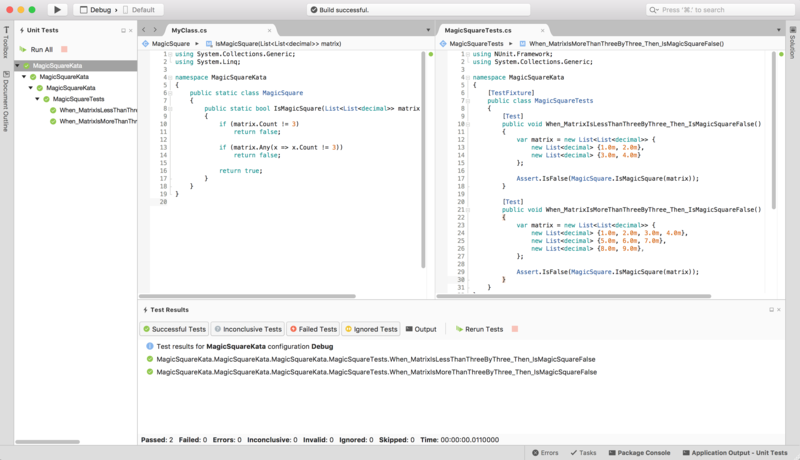 If you'd like, you can read more about what I've discovered... or just download Visual Studio for Mac and try it out yourself!